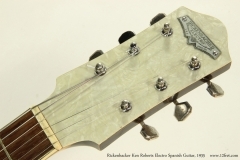 The Rickenbacker Ken Roberts Electro Spanish is one of the rarest guitars you’ll find, and it’s one of the very first production electric guitars. 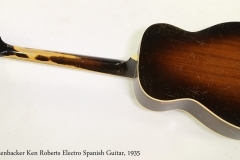 There were approximately 50 of these guitars built from 1931 to 1937, and few still exist. The Rickenbacker Ken Roberts model not only has a pickup, the neck is also ‘extended’ to meet the body at the 17th fret, and it has a vibrato tailpiece designed by Doc Kaufman. This exceptionally rare example is in good playing condition. Most people associate the first electric guitars with Leo Fender or the Gibson Les Paul, but the Rickenbacker ‘Frying Pan’ lap steel guitar predated those by almost two decades, appearing in 1931. 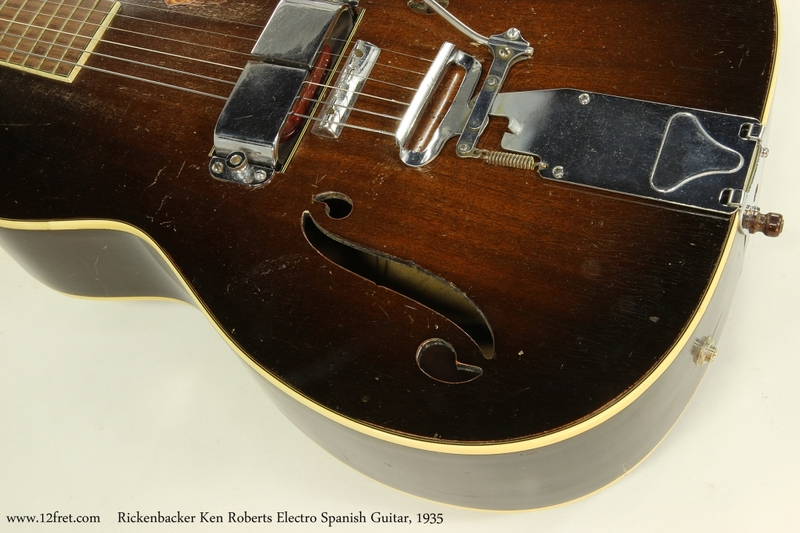 Rickenbacher (as it was spelled at the time) developed a large pickup using a horse-shoe magnet, an idea which was used for quite some time, and the aesthetics of that pickup were maintained on Rickenbacker basses long after the magnetic field was provided by standard pole pieces. “I don’t think I’m exaggerating when I say that the history of Southern California guitar makers is an unholy rat’s nest of confusion. 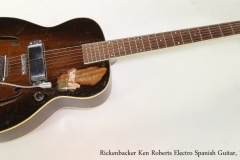 Take this Rickenbacher Ken Roberts model, for example. I’m not going to go into all of its story, but in one way or another it involves National, Rickenbacker, Dobro, Fender, Harmony and Mosrite. To start the confusion, the name on the headstock reads Rickenbacher, although Adolph Rickenbacker had changed the spelling of his name a few years before this guitar was made. Perhaps he was a frugal man and wanted to use up the metal nameplates he had with the old spelling, but who knows? 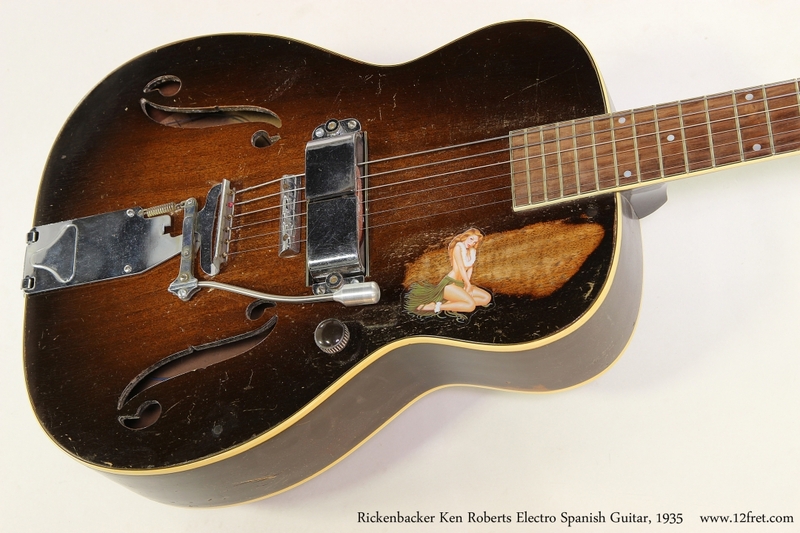 And then there is Ken Roberts, the man for whom the guitar is named. I can’t find out any info apart from the fact he was a Los Angeles based studio musician and a friend of George Beauchamp, the gentleman who inspired Rickenbacker to start making electric guitars. George Beauchamp was a vaudeville performer and steel guitarist who was always on the lookout for a louder guitar. He, along with the Dopera brothers and Paul Barth, was one of the founding partners of National guitars, although how much he had to do with the actual development of the resophonic guitar is still debated.